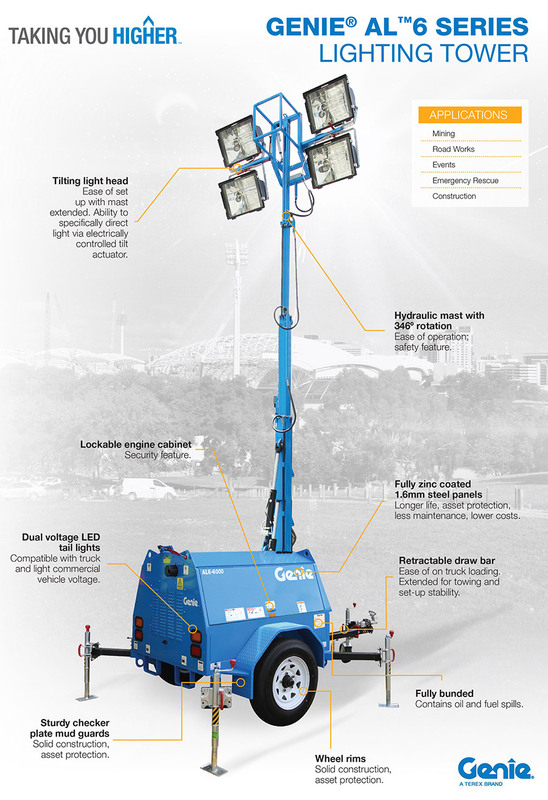 Genie has released two rugged lighting towers, specifically designed for tough work on Australian work sites. The Genie® AL™6 series lighting towers are wholly Australian designed and manufactured in Sydney. There are two AL6 light tower models available, the 6000 watt Genie AL6-6000 and 9000 watt Genie AL6-9000. Both feature a compact chassis, Kubota® diesel engine, retractable drawbar and hydraulic mast. Where applications require, mine specification and hydraulic outriggers are also available as an option. When fully extended, the mast height of the AL6-6000 light tower reaches 8.40 m high. When retracted and stowed, the overall height of the trailer is just 2.3 m. Total weight for towing is approximately 1500 kg. A 160 litre fuel tank provides sufficient diesel fuel for approximately 70 hours of continuous operation.